"To think of creativity in terms of transcendence is itself specific and partial--a lovely dream perhaps, but an inhuman one. "It is not only white writers who make a prize of transcendence, of course. Many writers of all backgrounds see the imagination as ahistorical, as a generative place where race doesn't and shouldn't enter, a place of bodies that transcend the legislative, the economic--in other words, transcend the stuff that doesn't lend itself much poetry. 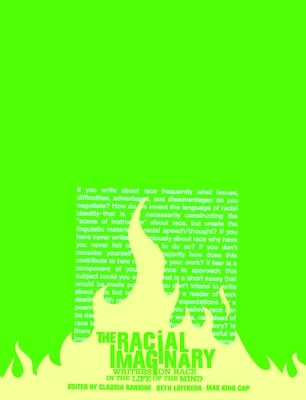 In this view the imagination is postracial, a posthistorical and postpolitical utopia. . . . To bring up race for these writers is to inch close to the anxious space of affirmative action, the scarring qualifieds. In 2011, a poem published in a national magazine by a popular white male poet made use of a black female body. A conversation ensued, and ended. Claudia Rankine subsequently created Open Letter, a web forum for writers to relate the effects and affects of racial difference and to explore art's failure, thus far, to adequately imagine. Claudia Rankine: Born in Kingston, Jamaica, poet Claudia Rankine earned a BA at Williams College and an MFA at Columbia University. Rankine has published several collections of poetry, including Don't Let Me Be Lonely: An American Lyric (2004) and Nothing in Nature is Private (1994), which won the Cleveland State Poetry Prize. Her work often crosses genres as it tracks wild and precise movements of mind. Noting that "hers is an art neither of epiphany nor story," critic Calvin Bedient observed that "Rankine's style is the sanity, but just barely, of the insanity, the grace, but just barely, of the grotesqueness." Discussing the borrowed and fragmentary sources for her work in an interview with Paul Legault for the Academy of American Poets, Rankine stated, "I don't feel any commitment to any external idea of the truth. I feel like the making of the thing is the truth, will make its own truth." With Juliana Spahr, Rankine co-edited American Women Poets in the 21st Century: Where Lyric Meets Language (2002) and, with Lisa Sewell, American Poets in the 21st Century: The New Poetics (2007). Her poems have been included in the anthologies Great American Prose Poems: From Poe to the Present (2003), Best American Poetry (2001), and The Garden Thrives: Twentieth Century African-American Poetry (1996). Her play Detour/South Bronx premiered in 2009 at New York's Foundry Theater. Rankine has been awarded fellowships from the Academy of American Poets, the National Endowment for the Arts, and the Lannan Foundation. In 2013, she was elected as a chancellor of the Academy of American Poets. She has taught at the University of Houston, Barnard College, and Pomona College. Beth Loffreda is a nonfiction writer and the author of Losing Matt Shepard: life and politics in the aftermath of anti-gay murder. She directs the MFA program in creative writing and teaches for American Studies at the University of Wyoming. She lives in Laramie, Wyoming.